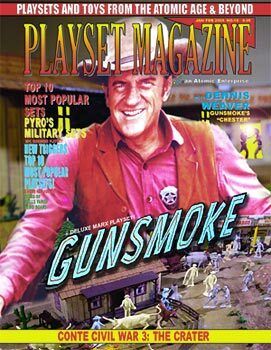 In this issue, you'll "RETURN TO GUNSMOKE" and the fabulous days of the Old West with the deputy of Dodge City himself, Dennis Weaver. As Chester, Mr. Weaver starred from 1955 to 1964 with James Arness as Matt Dillon, Amanda Blake as Miss Kitty and Milburn Stone as Doc in the longest running Western ever made for TV. 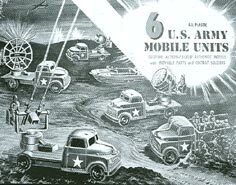 It was right in the middle of this period that Marx released their Gunsmoke playset featuring a Western stree of colorfully lithographed tin, stage, Ox wagon, cowboys, mine, and four figures of the main characters. Dennis is filming on a Western Street when we meet him and you'll be there as he sees himself in miniature for the first time as part of the figures from the Marx playset. Our story is framed around the set as he sees it for the first time and is given a set of reproduction figures "on behalf of the hobby". We've also cooked up some new product reviews, a few other stories and lots of ads to put your post-Christmas funds into.